There is a phenomenon I would call audience extension whereby a movie, book, game or whatever else ends up appealing not only to its original target audience but also to a completely different one. A book aimed primarily at children might end up being hugely popular with adult readers. Take Harry Potter, for instance. Or the animated TV series My Little Pony: Friendship is Magic that ended being a huge success with male viewers from 13 to 35. You just can’t predict these things. Audience extension is what must have happened with Reiner Knizia’s Pickomino, as well. We’re talking about a dice game, labelled for ages eight and up, about chicken fighting over their fried worms at the fried worm booth around the corner. And yet, inexplicably, it has a big following among adult gamers. You just can’t predict these things. But Pickomino is a very good filler between two heavier games, before dinner arrives or before everyone has to leave. It’s a very simple game, really. 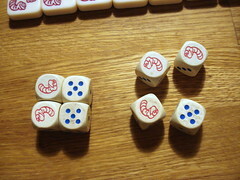 You roll eight dice that are almost standard, only the six has been replaced with a worm. Then you take out all the dice of one value, reroll the rest and repeat. You can not take out more dice of a value that you already took. You keep going until you either took all dice, decide to quit or cannot take any of the dice you just rolled because you already have all their numbers. That last option is not one you want to use, ending your turn like this doesn’t let you take any of the delicious grilled worms. The same applies if you end your turn without any worms. If, however, you do manage to roll some worms and then stop yourself before you mess up, you get to take a helping of barbecued worms. Add up the dice you picked – worms count as five – then take one of the worm chips. 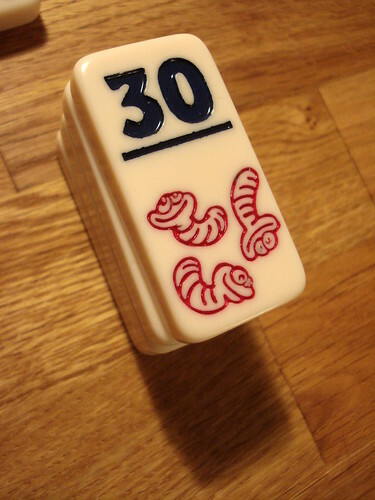 The worm chips come with numeric values from 21 (so stopping with fewer points is pointless, if you’ll excuse the pun) to 36, but only one to four worms. Thus, 21 to 24 all have the same value for your final score, but get to 25 and your points double – it’s a very simple concept, but it makes the push-your-luck aspect of the game so much harder. When the number you rolled is no longer available on the table, you pick the next lowest one. But if exactly your number is open in front of another player, you may steal it. This little rule alone is responsible for every single one of our games taking longer than the advertised 30 minutes. To keep the games from going on forever, you stack your worms when you get them, so only the last worm you got can be stolen. Still, with people caring more about annoying one another than about winning, this can go on for some time. Having a high and thus hard to steal plate of worms on top your pile does by no means make you safe, either. When you fail your roll, you not only get nothing this round, you also have to return your top worm and turn the highest worm still on the table. This is another small rule to keep the game short, because when all worms are either taken from the middle or turned over, the game ends. The winner is, obviously, the player with the most worms. With all this dice rolling, don’t let anyone tell you Pickomino is not a game of luck. There is just enough decisions to be made to keep you engaged, and the game is over before it becomes tedious. Unless you have three people sniping the 22 from one another for an hour… . You won’t get together to play Pickomino for the evening – unless you have kids , of course, then you may never get the chance to stop – but the strong push-your-luck aspect and the vindictive style of play with the right people are good reasons for a group of adults to break out this game when they know that pizza is in the oven.